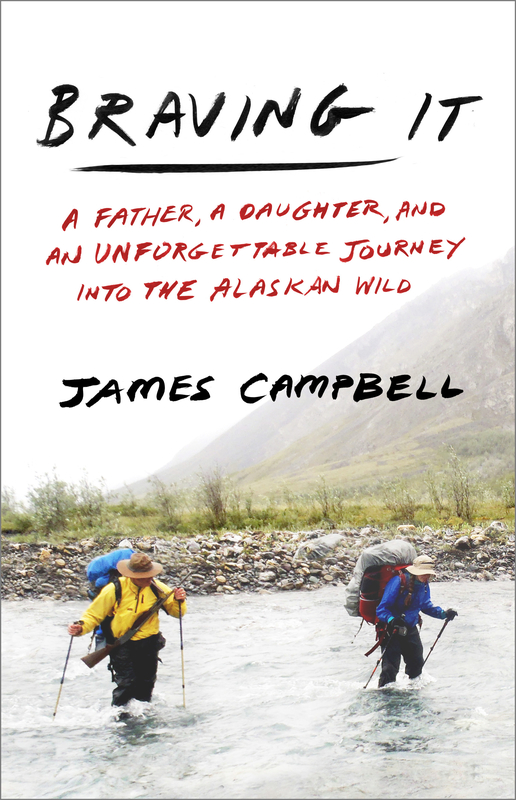 James Campbell’s new book, Braving It: A Father, A Daughter, and an Unforgettable Journey into the Alaskan Wild, could easily be a cautionary tale in how not to plan an adventure with your 15-year-old daughter. First of all, it would seem inadvisable to make your first trip to the middle-of-nowhere Alaska to help your animal-trapping cousin build a new home in the woods — from scratch. Or to return a few months later to brave the 50-below winter — and scrounge for food — in a glorified tent outside that cozy home. Or, on a final return trip to the state, to backpack through the soaked, windswept Brooks Range and then place a whitewater novice in a canoe to take on the icy Class IV rapids so far from civilization that a bush plane would have trouble getting to you. But if Campbell can be taken at his word, maybe such a trip is the kind of stuff that makes father-daughter relationships flourish. Braving It is a detailed portrayal of terrain so harsh it would give any seasoned outdoorsman pause, complete with grizzlies, brushes with hypothermia, and a growing bond that is honest, hard-earned, and touching. Below is a passage form the book, plunging headfirst into the rapids of the Hulahula River with James and Aidan. We all woke early again. I walked to the river, hoping to get a glimpse of the valley ahead, but the low-slung sky offered no views beyond the first set of rapids. At the cook tent, Dave [Musgrave, a longtime Alaskan,] was preparing an extra large kettle of oatmeal with an extra large helping of nuts, cranberries, and cocoa butter. Despite his fears about our food supply running low, everyone knew how exhausting the day would be and how much we’d need the extra calories. Tension on a trip like this comes with the territory – even among friends – but everybody’s fuse seemed a few seconds shorter than usual. “Let’s get a move on,” I barked at Aidan, who was meticulously packing her backpack. When I offered Dave a hand taking down his tent, he grunted a barely audible “No.” The previous evening I had tried to help him set it up in a fierce wind, but my help had turned into a hindrance, and eventually he put up the tent on his own. By 8:30 a.m. we’d already broken camp and paddled across the river, away from the mouth of Esetuk Creek. We were scouting again. The rapid we would encounter just fifteen yards downriver was a large one, followed, almost immediately, by a hairpin turn and another big set of rapids. Aidan spotted a nice line and we elected to run it. Aidan and I paddled upstream against the current, hugging the rock wall to river left. Thirty yards up, we turned the bow slightly in to the current, leaned downstream, and peeled out, letting the river do the work. Now we were looking right at the rapid. The next thing I knew she was surrounded by water. I couldn’t see her, but I heard her yelling, “Left, left. Hard.” I knew that we were through the first rapid and bearing down on the wall and the hairpin turn. I saw two boulders looming up out of the water, followed by a five-foot drop-off and a large wave curling back upstream. How could we have missed it when we were scouting? Adrenaline shot through me. Aidan pulled the bow to the left and I tried to pry the stern in the same direction, but it was slow to respond. The rocks bumped my right gunwale and I saw the bow bounce toward the ledge. Aidan missed it, just barely, but now she was on a collision course with the huge wave. She was screaming, but all I heard was the river and the echo of her voice. If she couldn’t get the bow over, the wave would capsize us. When she caught its edge, and it kicked her sideways, I knew she’d be okay. But I had less than a second to do the same. Again, I jammed my paddle into the water and tried to crank the stern away from the ledge. I missed it, but the outside of the wave caught the back of the canoe. I could feel it about to dump us when I slammed the face of the blade against the water on my left side. The next few seconds passed in a blur, but when we exited the wave, we were still upright. Though they had had an easier time of the rapid than we, Chris Jones, who was another friend of mine, and Dave had also taken on a lot of water and needed to bail. They pulled their canoe onto the sandbar next to ours. We emptied the water out of our canoes and walked downriver to see what the Hulahula [River] had in store for us. The canyon walls tightened and the river made an abrupt turn to the right. From that point on, our only option was to run the huge rapids blind or line the boat down the willow-choked bank on the right side of the river. We waded into the numbingly cold water and pulled the boat downriver. Our progress was impeded by the moss-covered rocks. We slipped and fell, banging our shins, knees, elbows, and hands. Just when we thought things could get any harder, they did. The rapids got bigger and the rock walls closed in. So much water was pushing through the narrow canyon that Aidan could barely hold on to the bowline. In the stern, I’d choked up on the rope to control the canoe and was leaning back on it with all my weight. Too much slack and the current would turn the canoe broadside and capsize it. It was almost noon when I saw Chris and Dave walking back to us. They’d tied off their boat downstream and had come to help. Aidan’s head was down and she was plodding forward. Aidan pried her cramping hands off the rope and Chris took over as we entered a part of the river with the largest rapids we’d seen yet. The last fifty yards of rapid run was excruciating. My shins were battered from falling and my arms and leg muscles ached from holding the stern line and restraining the canoe. At one point, I allowed too much slack to build in the line and the boat took off. I leaned back and waited for the jolt as it tightened. When it did, it felt like my shoulders were going to pop out of their sockets. When we were finally through, Chris tied off the bow and Aidan the stern, while I lay back in the rocks, panting. It took minutes for me to make it to a sitting position. We spent another grueling two hours lining the boats and then arrived at a section of rapids we decided to run. Under different circumstances we probably would have elected to line them, but fatigue had made us less careful. Chris and Dave went first. We watched their boat lean hard to the right downriver and thought for sure they were going over, but somehow they pulled out of it. Aidan looked at me as if to say, Okay, Dad. It’s our turn now. “I got the line, Dad. You ready?” she said with the kind of confidence that took me aback. Just days before, she wouldn’t have asserted herself. Now, it was Aidan, though exhausted, bruised, and bloodied, making sure I was ready. The current grabbed us with the ferocity we’d yet to experience. It threw us at the rapids. For fifty yards, we were enveloped by water. Half a minute later, it spat us out into an area so calm that for a moment I wondered if we were on the same river. “Way to go, Aidan,” Dave hooted. For the next quarter mile we had an easy flatwater paddle and I used the opportunity to relax. But Aidan watched the river like a raven. “Relax and enjoy the scenery,” I told her. “Relax and enjoy the scenery,” I heard her mutter. The Hulahula was too full of surprises for her to let down her guard. “Anybody hungry?” Dave shouted across the water. We tied off on the left bank and lay back on a large rock, eating pilot bread and peanut butter. A snack never tasted so good. The only problem was the mosquitoes. It had been so cold we’d had few encounters with them, but five minutes into our meal they emerged from the bushes in droves. “Paradise lost,” I said to Aidan, getting up from the rock. Chris and Dave had already fled the mosquitoes and were downstream on a ridge, inspecting the river. “How does it look?” I asked. Chris and Dave were already a hundred yards ahead of us when we shoved off. We navigated the first stretch of Class III rapids and then came to a place where the river made a dramatic turn to the left. We tried to back-paddle to get some sense of what lay ahead, but the current was too strong. We came hard at the wall, and for a second or two the current held us there. I could smell the deep, musky scent of wet rock and moss. My inclination was to get away from the wall as soon as possible, but we let the water do the work. If we’d learn anything since we started a week ago, it was that sometimes we had to surrender to the river. The current threw us violently back into the rapids, and Aidan chose a line in a split second. There was no yelling now, only intense concentration. And then it was over. The gorge was behind us. Up ahead was a wide-open country of long, molded green mountains. One hundred yards down from the end of the gorge, we spotted Chris and Dave. They’d found a campsite along the left bank of the river, between Kikiktat Mountain and a 2,250-foot-high glacial moraine that went by the name of Kingak Hill. When we made it to shore, Chris had the bottle of whiskey waiting. He walked up to us and handed it to me. “To the gorge,” I said. I took a long swig and then another. I gave it back to Chris, and he had one, too. Chris took one more slug and pocketed the bottle. We set up camp, and Aidan got out the cards. We played Rummy 500 and passed the whiskey around. After two good swigs, I started to feel it. Dave handed it to me one more time, but I abstained. “I wanna be able to find my way back to the tent,” I said. After an hour of cards and supper, Aidan, Dave, and I walked back to our tents. One of Aidan’s favorite times was when, at the end of a trying day, she could crawl into her sleeping bag and write in her journal or read a book. I was helping Dave put up the bear fence when we heard Chris shout. As the bear approached, we realized it was not just one grizzly but three—a honey-colored sow and two cubs, one black and the other blond. We stood together and talked to the bears in calm but loud voices. If the grizzlies smelled us, or heard, or saw us, they didn’t show it. I’d read that grizzly bears are the masters of studied indifference. They know exactly where you are, but pretend not to. When they were fifty yards away, they came to an abrupt stop and the sow stood on her hind legs and sniffed at the air. Slowly, she got down on all fours. “Go on, girl, go on,” I said aloud. The last thing I wanted to do was pull the trigger. If she ran at us I’d be forced to make a two-second decision about whether she was bluff-charging or coming for real. I knew that, if it was the real thing, I would orphan the two cubs, but I would shoot as fast as I could to defend my own. But the momma grizzly and her two cubs turned. They shuffled away and lumbered up to the top of a low bench just west of our campsite. They disappeared until curiosity got the best of the two cubs and they wandered back to the edge of the ridge and watched us. Then, suddenly, they bolted. After they did, we decided that we needed to investigate. We didn’t want the sow and two cubs wandering into the camp when we were asleep. We walked up to the top of the ridge and surveyed the tundra. “Where’d they go?” Aidan asked. We hiked west for an eight of a mile, and then we split up. Aidan and I went north and Chris and Dave went south. When we met back at the cook tent, everybody was wondering the same thing: Where could they have gone so fast? Having no way to find out more, Aidan and I said good night to Chris and Dave and then headed for our tent. While Aidan crawled inside to organize our sleeping bags, I glanced back toward the ridge, and for a moment thought I saw the cubs still watching us. Reprinted from Braving It: A Father, a Daughter, and an Unforgettable Journey into the Alaskan Wild Copyright © 2016 by James Campbell. Published by Crown Publishers, an imprint of Penguin Random House LLC.